It's 65 years since Hitler drafted his will before committing suicide. The men who translated it were Germans who fled to Britain to take up arms against their own country. Two new memoirs shed light on this little-known group. The outbreak of World War II saw thousands of people across Europe volunteer for military service, in a bid to do their duty for their respective countries. But among those who stepped forward for Britain were 10,000 German and Austrian nationals, who had fled the Nazis and were willing to fight against their own countrymen. Known as "the King's most loyal enemy aliens" many, but not all, were Jewish. Among them was Herman Rothman, a Jew born in Berlin. He came to England aged 14 on the Kindertransport, fleeing Nazi persecution shortly before war broke out in 1939. 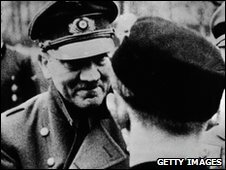 In October 1945, Mr Rothman and a handful of other German Jews were given a top-secret task - to translate the political and personal wills of Adolf Hitler. He had written them on 29 April earlier that year, then committed suicide, probably on 30 April - the exact date remains uncertain. 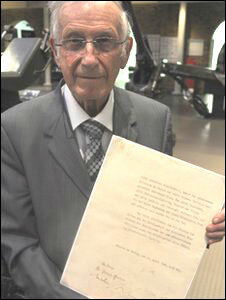 Now 85 and living in Ilford, Essex, Mr Rothman has written a book called Hitler's Will about his military service. He became a British citizen in 1947, meaning he fought for Britain while still a German. "I wanted to do my very best for the British war effort," he says in a voice still enriched by a German accent. "There was no question in my mind that the Hitler regime would exterminate people who were opposed to it, and I wanted to do my very best to see that regime finished as quickly as possible. All of those who escaped from Germany felt the same." Allowed to enlist in May 1944, he ended up working in the 3rd Counter-Intelligence Section for the British army, his fluency in German proving a vital skill. As a soldier he was known as Harry Rothman. It was while working in Fallingbostel internment camp in Germany that Mr Rothman was woken up early by his commanding officer, who urgently requested his presence. They were told how a man had been arrested and papers were found sewn into his coat's shoulders. He'd been spotted by a suspicious soldier who had worked in a West End department store and had noticed the coat was oddly shaped. These documents, typed in German on parchment, were quickly identified by Mr Rothman and his colleagues as Hitler's personal and political wills, along with Joseph Goebbels' addendum. Three copies of the documents had been made by Hitler. Two of them were later acquired by the Imperial War Museum in London, these included the actual documents handled by Mr Rothman - who was given Goebbels' words to translate. "Goebbels wrote in very long sentences that I had to punctuate in order to make sense of them," says Mr Rothman. "Hitler's wills weren't on ordinary paper, but on parchment. The letters were typed in capitals. "The will had his signature on it in other ways. Nobody writes a letter on parchment. I got the feeling that, with this last act, he wanted to impress the German people." Only on one occasion did Mr Rothman lose his temper with his countrymen, when some imprisoned Nazi officers complained to him about a lack of food. "I said to them - who is to blame, ultimately, for the food shortage? Can anybody be blamed but yourselves? You instrumented the war and now you come to me and complain you haven't got any food? You are abschaum der menschheit - scum of the earth." Mr Rothman now says he should not have used that insult, and that it prompted a complaint against him from the prisoners. But he was cleared after a brief inquiry, although he suggests it perhaps "cost him a medal". Still, he says he doesn't regret saying it. Another German who fought for Britain was Claus Leopold Octavio Ascher, born in Berlin in 1922, who later became Colin Edward Anson. He fled Germany days before his 17th birthday, his family being fearful for his safety. His father Curt, an outspoken opponent of Hitler's, was arrested in September 1937 and taken to Dachau concentration camp. He died a month later. Although Curt was Jewish, Mr Anson's mother was Protestant and he was raised in the latter faith. Arriving in Britain in February 1939 with little command of the English language, Mr Anson volunteered to fight for Britain after the outbreak of war, joining the Pioneer Corps. "I felt, like many refugees, that it was very much my own business and that I couldn't stand by and let other people sort it out." 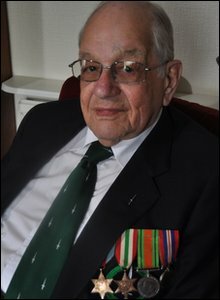 Now aged 88 and living in Hertfordshire, Mr Anson has co-operated on his memoir, called German Schoolboy, British Commando, with author Helen Fry. He says he received "friendly interest and compassionate understanding" from Britons who detected his Germanic origins. "I've never had any hostile or unpleasant reactions. Never. They were quite aware that refugees from Nazi Germany were opposed to the Nazis." In 1942, when alien nationals were allowed to transfer to other units from the Pioneer Corps, Colin was accepted into 3 Troop Commando, consisting solely of German-speaking refugees who underwent intensive and specialist training. These foreign soldiers were also advised on personal security issues, given their backgrounds. They were told to make up cover stories in case they were ever captured to account for their accents - that they had spent time in Germany as children, for example. They were also told to change their names to more English versions, with the same initials as their Germanic names, to help them remember these new identities. Colin chose his new surname because, at the very moment he was asked to make one up, an Anson communications plane flew overhead. 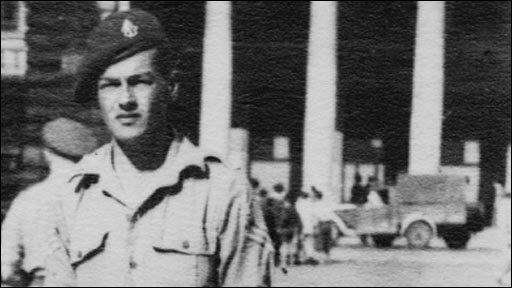 After completing his training, Colin was attached to another commando unit and took part in the invasion of Sicily, where he suffered a head wound so severe it left part of his brain exposed and he was not expected to survive. But he did eventually recover, serving the British again on commando raids in Yugoslavia, Albania, and then in the liberation of Corfu. His language skills became invaluable as increasing numbers of German POWs were captured. Did he have any qualms about fighting fellow Germans? "I can't say I gave it much thought. When we were in action against enemy forces something in a grey uniform was a target to shoot at. "It was only afterwards when you took prisoners - and I much preferred to take prisoners rather than killing people - that the whole question arose. "I had to remind them that it was I who was asking the questions." He says he feels no animosity towards Germans who fought for Hitler. "I can't find it in my heart to be critical of people for having been in the Nazi party at that time. What else should they do under the circumstances? What else should they have done? They were called up and did their duty, as they saw it, for their country. They had very few opportunities for acting otherwise." Mario Cacciottolo examines Mr Rothman and Mr Anson's stories in more detail on Breakfast on BBC 1 at 06:00 BST, Saturday 1 May. Brilliant. Good men. I had always understood that any Germans in Britain at the time of the outbreak of the war were assumed hostile at worst, or at best, not utterly dependable. I recently worked with a German friend whose uncle had been both decorated by, and murdered by, the SS. The entire German nation was as afraid of Hitler and the Reich if they spoke out, as they were afraid of Bomber Harris' efforts. The guys in this story really should be celebrated - had they themselves become POWs you can assume that the Nazis would have created a whole new level of foul brutality for their treatment. It must be very hard to take sides against your country of birth, even when you believe the people in charge are in the wrong. The actions of these men, at a time when the full extent of the wickedness of the Nazi regime was not as obvious as it was to become, are particularly courageous. What a decision to have to make by the parents of these boys, and by the boys themselves. The biggest decisions most people have to make cannot compare. There were many brave Germans who worked on the inside against the Nazis. They begged for support from the Allies, but it was usually impossible until the later stages. During the famous ill-fated conspiracy to assassinate Hitler, contact was made with the Allies, but Roosevelt had publicly insisted on unconditional surrender, and the destruction of Europe continued. Had Germany been allowed to negotiate for peace, the Holocaust might not have been exposed to the world. Who were the British fighting in WWII? The Germans or the Nazis? These very brave men fought against their country, and are lauded for it. But, William Joyce fought, or at least acted against his country, and is branded a traitor. If we were fighting the Nazis, why were the Germans held to be responsible? I suppose it's a case of the victors making the rules. This is very moving. The humanity of the two men is very touching.